We are having a cookie exchange at work today. I'm kind of excited because I've never participated in one before. The closest I have come is when I lived at Five Girl Farm in Austin and we all baked for the holidays together, so we had a variety of cookies around the house for the whole holiday season. I have tried to do it by myself over the years, but there are only so many cookies one person can make in any given season, and even less that one can consume and only so many one can give away. And I was getting tired of my usual rotation, as I've mentioned in an earlier post. I wanted to make something new our exchange, but something that I associated with Christmas. And I thought back to that time when we all baked our holiday treats together at the Farm, and I remembered Susie's Snickerdoodles. I had never heard of Snickerdoodles before my housemate Susie made them, and I laughed at their silly name. A native Austinite, Susie had grown up making them. They looked like a sugar cookie with cinnamon and sugar instead of just plain sugar, but when I took a bite of them it was immediately evident to me that these were much more than sugar cookies. Crisp on the outside and chewy on the inside, there was a unique, tangy undertone from the cream of tartar that was like nothing in the world I had ever tasted. She was kind enough to give me the recipe, but I never made them. So I thought this would be a good time to pull out the recipe and give them a try. But when I went to get it, I could not find it. I have no idea where it went. I do still have all of my old recipe index cards in the original box, and as far as I know it has stayed there untouched for all of this time, but the recipe was not there. So I looked in my backup book, and then my computer files, but it was nowhere to be found. This bummed me out. I couldn't make the same cookie that Susie made all of those years ago without her recipe. And, if I don't have the Snickerdoodles recipe, what other recipes have I lost over the years that I don't yet know are gone? 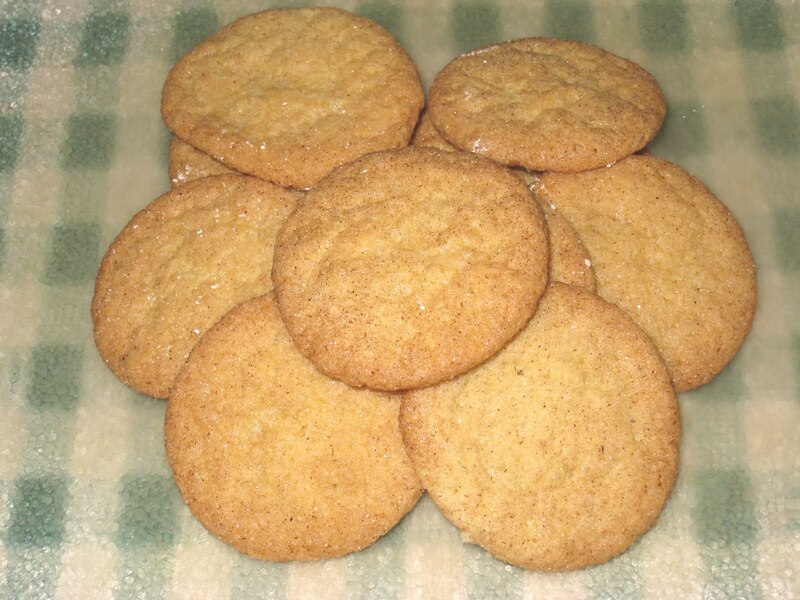 I turned to my many cookbooks, but could not find a recipe for Snickerdoodles in any of them. I finally found one in the International Cookie Cookbook, but it used baking powder and baking soda instead of cream of tartar. I know that shouldn't make that big of a difference, but I wanted to get as close to the original recipe as I could and the cream of tartar lended that indefinable tang that made those cookies so darned good. I finally found some recipes online and, after comparing a few of them, came up with what looked like it would work. And it did work. These are delicous, and almost as good as I remember them. I am betting that the original recipe had shortening in it, because they were softer and not as crisp as mine turned out, and the centers were more chewy as well. But these are definitely keepers. I won't wait so long to make them again. Beat the butter with a hand mixer on medium speed until it is creamy. sure it is well blended before adding the second egg. refrigerate for at least 30 minutes (or up to 3 days). dough back in the refrigerator between batches. Bake the cookies for 13-16 minutes, until the edges are slightly firm. minutes. Do not let the cookies get too brown. cool completely on the racks. Store in an airtight container. adapted from several recipes found online, but mostly this one.